This book is designed primarily for upper level undergraduate and graduate level students taking a course in multilevel modelling and/or statistical modelling with a large multilevel modelling component. 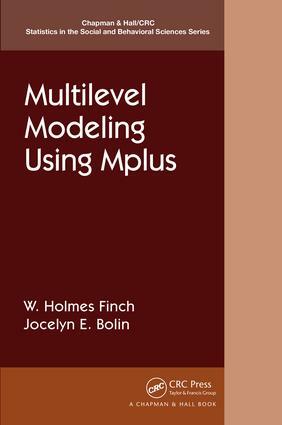 The focus is on presenting the theory and practice of major multilevel modelling techniques in a variety of contexts, using Mplus as the software tool, and demonstrating the various functions available for these analyses in Mplus, which is widely used by researchers in various fields, including most of the social sciences. In particular, Mplus offers users a wide array of tools for latent variable modelling, including for multilevel data. Linear Models. An Introduction to Multilevel Data Structure. Fitting 2-level Models. Additional issues in fitting 2-level models. 3 Level and Higher Models. Longitudinal Data Analysis using Multilevel Models. Brief Introduction to Generalized Linear Models. Multilevel Generalized Linear Models (MGLM) and Multilevel Survival Models. Brief review of latent variable modeling in Mplus. Multilevel latent variable models in Mplus. Bayesian Multilevel Modeling. Appendix: An Introduction to MPlus. Holmes Finch is the George and Frances Ball Distinguished Professor of Educational Psychology, and Professor in the Department of Educational Psychology at Ball State University where he has been since 2003. He received his PhD from the University of South Carolina in 2002. Dr. Finch teaches courses in factor analysis, structural equation modeling, categorical data analysis, regression, multivariate statistics and measurement to graduate students in psychology and education. His research interests are in the areas of multilevel models, latent variable modeling, methods of prediction and classification, and nonparametric multivariate statistics. Holmes is also an Accredited Professional Statistician (PStat ®). Jocelyn Bolin is an Associate Professor in the Department of Educational Psychology at Ball State University, and received her PhD in Educational Psychology from Indiana University Bloomington in 2009. Her dissertation consisted a comparison of statistical classification analyses under situations of training data misclassification. She is now an Assistant Professor in the Department of Educational Psychology at Ball State University where she has been since 2010. Dr. Bolin teaches courses on introductory and intermediate statistics, multiple regression analysis and multilevel modeling for graduate students in social science disciplines. Her research interests include statistical methods for classification and clustering and use of multilevel modeling in the social sciences. She is a member of the American Psychological Association, the American Educational Research Association and the American Statistical Association. Jocelyn is also an Accredited Professional Statistician (PStat ®).